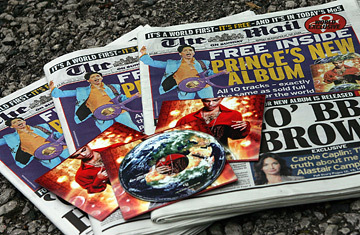 When Prince's new album Planet Earth was released in the U.K. on July 15, almost 3 million people picked up a copy. Normally, that kind of news conjures up images of record industry execs high-fiving each other and fans streaming into record stores to empty the shelves of their hero's latest offering. But in this case, the record industry execs are livid. And it's true there isn't a single copy of Planet Earth in any store in the country  but only because they were never there in the first place. In fact, Prince didn't sell any copies of his album in the U.K. He gave them all away. In an unprecedented deal, Prince granted British tabloid the Mail on Sunday exclusive rights to distribute his new album as a freebie. Cutting out record stores, online sellers, and even his U.K. label, Sony BMG, he decided to take Planet Earth straight to the people, and all it cost them was the paper's $3 cover price. "It's direct marketing," the pint-sized popster said when the deal was announced three weeks ago. "And I don't have to be in the speculation business of the record industry, which is going through a lot of tumultuous times right now." As his fans rejoice  another middle finger to The Man!  the music industry is reeling. While Planet Earth is due to hit shelves in the U.S. on July 24, Sony BMG announced that with so many free copies floating around, it won't be releasing the album for sale in the U.K. at all. Music retailers boycotted the paper, until HMV reluctantly agreed to stock it, just this once. "We decided we could either get marginalized or we could get right in there," says spokesman Gennaro Castaldo. "With whatever reservations, our motivation was to give our customers the choice and access to the album." But what the industry is really worried about is what happens next. CD giveaways (or covermounts) are common practice, as magazines try to entice buyers with new indie rock compilations and newspapers look to shift copies with archive material from older artists. Just last month, the Mail on Sunday gave away a Peter Gabriel CD: a mishmash of not-so-famous tracks and live performances. But this is the first time in the U.K that a top-selling established artist has ever given away a full-length new release for nothing. What if others follow Prince's lead? How will retailers, who are already struggling to compete with supermarkets and online stores and Starbucks, survive if artists cut them out of the loop? And without the income generated by big name acts, how will record labels support and promote lesser-known artists? "If we keep moving down this particular route, companies will only release records that are sure home runs," says Martin Talbot, editor of industry paper Music Week. "That means either stuff by established artists or unknown artists doing cover versions. There is the danger that it will no longer be worth it for companies to invest in new, up-and-coming artists. And if record companies don't invest in them, who will?" In a world where free usually means worthless, many in the industry can't stomach the idea that one day consumers could pick up the new Eminem album with every packet of M&M's. But one man's freebie is another man's fortune. Prince was reportedly paid $500,000 over and above the royalties for each CD  typically around 10%. Considering that his last album, 3121, sold only 80,000 copies in the U.K., this deal may have earned him more than eight times as much. Plus, Planet Earth  which has gotten fairly good reviews so far  is now in the hands of thousands of people who may never have thought to buy it. Maybe they like what they hear ... and maybe they want more. They'll have to settle for buying up his back catalog, because the 21 shows he's playing in London in August and September are already sold out. Naturally, he's giving away a copy of the album with every ticket (a trick he pulled with Musicology back in 2004). For its part, the Mail on Sunday printed, and sold, an extra 600,000 copies in addition to the 2.3 million they usually sell every week. Advertisers find it hard to resist those kinds of sums. And according to managing director Stephen Miron, his office has been flooded with calls from other artists wanting in on the action (as for who, he won't tell). "They are saying they think this is a much more effective and efficient way of building up their business." There's no ignoring this bigger, stronger breed of freebie, but there's also no reason it has to signal the death of the music industry. Thanks to the rise of digital distribution, the business of making and selling music has been in flux for years, with labels, lawyers and retailers constantly forced to adapt. "In the record industry, you can barely hear yourself think for the sound of the business being dismantled and the paradigms being broken," says Conor McNicholas, editor of music weekly the New Musical Express. Those who can't keep up are flailing  last month, HMV reported its annual profits have more than halved  or already fallen: last year, retail giant Tower Record sclosed its stores and in June the U.K. music chain Fopp shut up shop. Meanwhile, record labels are looking for solutions in mergers and takeovers  any day now, British firm EMI could be bought out by investment group Terra Firma. Says McNicholas: "With the pace of change, you just have to be very quick on your feet and rework your business model every six months  that's the challenge." Manager Garry Blackburn thinks it's a challenge the industry can't escape. There are rumors that one of the bands he works with, the veteran British ska group Madness, is considering a deal with another national newspaper to release their upcoming new studio album. Blackburn won't confirm or deny, but says he's a big fan of the freebie. "If everybody takes a deep breath and considers what's going on, this is a wonderful opportunity," he says. "Yes, it means the industry will be dramatically different in a few years, but I don't think screaming like a bunch of girls is going to help anything. They need to think of a way to use it to their advantage." Setting music free: could be a Sign O' the Times.